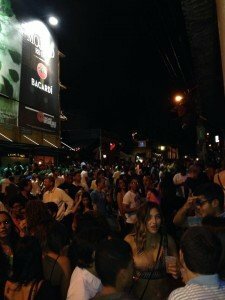 La Placita de Santurce - Puerto Rico is Music! When I started my research to identify places where you could dance salsa in Puerto Rico there wasn’t a single place on the internet that had an updated list of salsa venues. There were mentions of places in Tripadvisor and other travel websites and a longer list in a salsa forum, but all of them were outdated. Only two venues still existed and one of them took me by surprise, since I associated it to bananas, mangoes, vegetables, restaurants and drinks, but never with salsa music. The place is La Placita de Santurce. During the day, La Placita (diminutive for “Plaza del Mercado” or marketplace) is a picturesque farmer’s market where the locals go to purchase fresh produce for home made food. It was established one hundred years ago in lands donated to the government. Over the years, the plaza has undergone various remodelations, the last one in the early 2000s. This is when the famous Avocados sculptures were placed, a work by sculptor Annex Delgado. 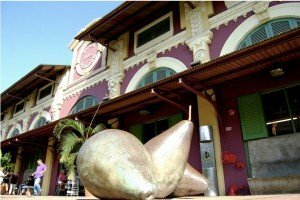 Everyone refers to them as “the Sila avocados”, alluding to the name of the person that commissioned the sculpture, former Mayor, then Governor Sila M. Calderón. In the beginning the poor avocados were criticized, but today it is impossible to hear about La Placita without imagining them. At night and on weekends, La Placita becomes the place to be seen and get together with friends for a good time. You will find a diverse crowd that combines people from different generations, education levels, social backgrounds. 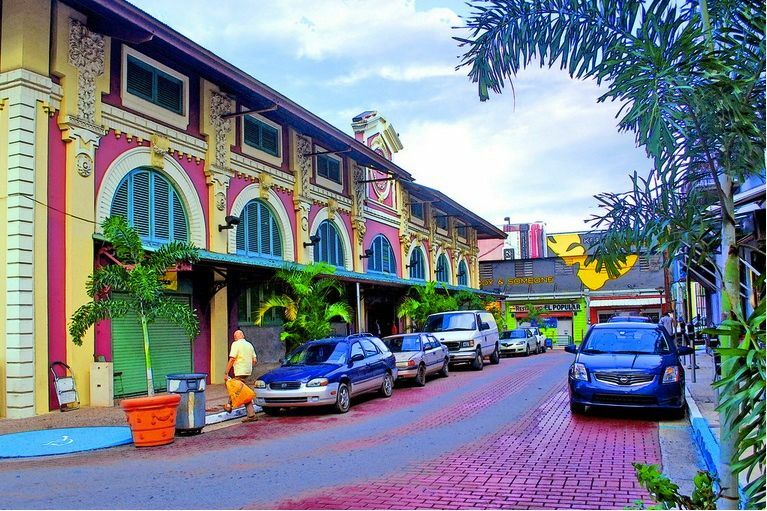 From the tourist’s perspective, La Placita is the place that you want to go if you like to do what the locals do. You will find a strip of restaurants, cafes, and bars lining the side streets of the square around the Placita. The prices are significantly lower than in the hotels. La Placita is crowded on weekends, specially on Thursday nights. I am not sure when the tradition started, but Thursdays is the day in which university students prefer to hang-out since they usually return to their hometowns on Fridays. Another reason is that a three-day weekend is not enough for Puerto Rican genes that demand more fiestas in their blood. You will find a lot of salsa, bomba and plena on the Placita’s outdoor stages. Many restaurants and bars have their own activities inside inside their locals too, most of them with live music. Check the Events section of our website to find out about upcoming events in La Placita. If you have kids, the zanqueros are fun to watch. 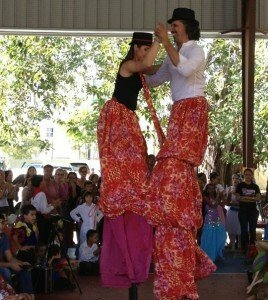 These are guys and gals walking on top of huge stilts. They are usually accompanied by lively music, such as plena (one of our native rhythms) and batucada (a Brazilian sub-style of samba music), both of which have a strong African percussive style.The zanqueros will perform on Sunday at 2:00 p.m. If you like salsa, you need to be there Saturday at 9:20 p.m. to watch Raphy Leavitt and his Selecta Band. This is a unique opportunity to watch a classic salsa band and listen to songs that have been consistently listed in the best all time salsa charts, such as Jíbaro Soy and Cuna Blanca (a tribute song to one of the band’s performers that became their signature song). Marrero, the band’s leading singer has an unmistakable timbre of voice. For those interested in folkloric music, then you will enjoy the jíbaro music and troubadours on Sunday at 3:00 p.m.
Click here to see the other activities during the Anniversary. La Placita is located at 205 Capitol Street, around Parada 18 in the Santurce district. Click here to find the location in a map. The place is opened Mondays through Saturdays from 6:00 AM to 6:00 p.m. and Sundays from 6:00 AM to 12:00 p.m. Hours listed are for the “Plaza del Mercado”. Bars and restaurants are open late night but not all open every day of the week. The second venue that was consistently mentioned in the old salsa venue lists was La Respuesta, for which we will write a separate article. In addition to these two we found lots of new salsa spots, which we list in the Puerto Rico is Music E-book. This picture was taken on Saturday, after we wrote this article, perhaps during Raphy Leavitt’s performance, who knows? This is what we meant when we said it gets “crowded”.